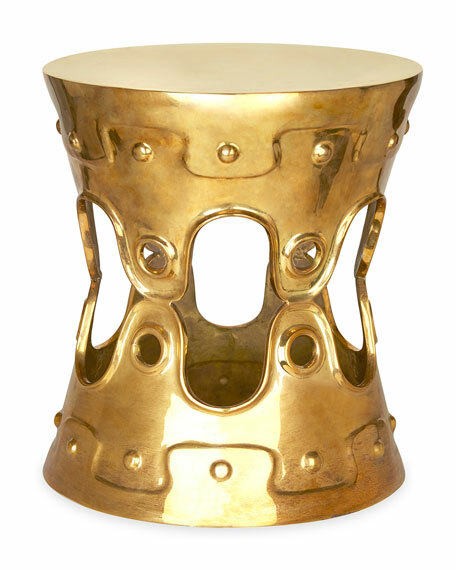 Individually sand-cast and hand-polished by artisans in India, our Brass Ulu Side Table functions as an end table or a stool. Sculptural cutouts add mod appeal to this riff on the traditional taboret table. Add a dash of hippie and a dollop of socialite to your favorite room! Side table of solid polished brass. Boxed weight, approximately 30 lbs. EXCLUSIVELY AT NEIMAN MARCUS Handcrafted of agglomerated stone. Hand-painted aged-granite lacquer finish. Finish will age and weather like natural stone. Three-tier tall side table. Metal frame with gold-paint finish. Chilean pine shelves with brushed, rough texture. 38"W x 24"D x 38"T; top tier is 10"D. Imported. Boxed weight, approximately 65 lbs. Intricate carving detail to appear like an actual tree trunk. Use as a garden stool or side table. Unique color and design for any outdoor setting, contemporary or traditional. 20"W x 19"D x 16.5"T. Outdoor safe. Resin. Imported. Boxed weight, approximately 30 lbs. Handcrafted end table. Design inspired by ancient horse bridles. Forged iron with a hand-painted rustic-bronze patina finish. Tempered glass top. Handcrafted end table. Design inspired by ancient horse bridles. Forged iron with a hand-painted rustic-bronze patina finish. Tempered glass top. Assembly required. 25"W x 19"D x 26"T. Imported. Boxed weight, approximately 44 lbs.